Guarantee 1 min+ Spin Time! Professional inline skate 608 bearing with Premium Ceramic balls. 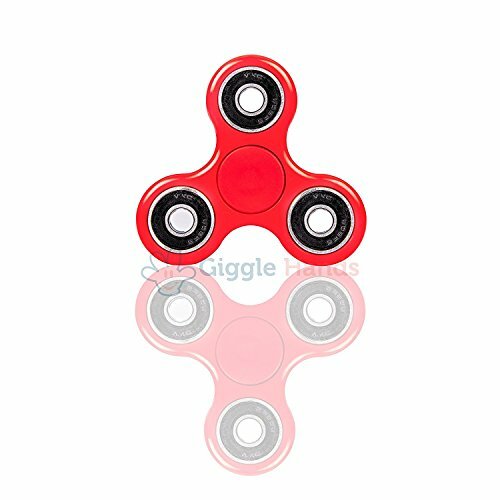 Great Toy For Fidgeters, Anxiety, Focusing, ADHD, Autism, Quitting Bad Habits, Staying Awake Ideal for people trying to quite nail biting, smoking, leg shaking and all type of attention disorder issues. Ergonomic curved shape design for hand comfort and long term usage. Simply flick and spin for hours with one or two hands! High Speed Hybrid Ceramic ball in the center to ensure the smoothest rotation and consistency. 3 Steel 608 counterweight bearing weights to increase centripetal force and spin time. No Repair, Oil, Maintenance needed! Use it right out of box. All 4 bearings are removable for future upgrades, after market modification and customization! Restless mind and fidgety hands? This spinner is the solution! No more 3D printing and edge sanding! Durable ABS frame construction with rounded edges, complimentary cap cover!